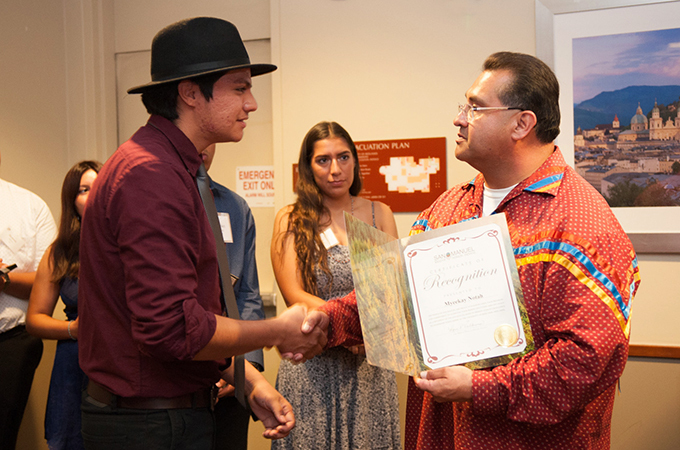 While I haven’t always felt at home on campus, I was feeling darn good recently when I was recognized as a recipient of the San Manuel Band of Mission Indians Excellence in Leadership Scholarship at a special reception on September 10. As a member of the Navajo tribal nation, I have found no one wants you to succeed more than fellow members of the Native community, especially when it comes to education. Thanks to the generous contributions of San Manuel, U of R offers Native Student Programs (NSP), Native studies courses, and scholarships for Native and Native Hawaiian students. When I went to my first meeting of the Native American Student Union (NASU), I thought, “Why didn’t I come here sooner?” It was probably just me being shy at first, but once I started getting more involved with NASU and NSP, I felt a sense of belonging in a space where I could be myself. I was recently approached by the NSP team to serve as their intern—I am grateful that they saw something in me, and I am gaining a lot of experience working in the office, learning more about the Native community. All these thoughts were dancing in my mind when I walked into the University Club for the scholarship reception and found my nametag, like someone at an important conference. I was full of pride, and I looked good in my maroon button-up shirt, black leather jacket, black slacks, black wingtip Oxfords that I like to call my “blues man shoes,” and, finally, my signature black fedora (if you have ever seen me on campus, you might recognize me by this hat; I think of it as my trademark look). Christina Lara ’19, my girlfriend and current NASU president who originally guided me into the Native community here on campus, joked how we looked like we were dressed for a funeral, but we were just trying to look our best to be respectful of the attendees, including members of the scholarship committee and The San Manuel Band of Mission Indians Bird Singers. Once everyone was settled, Ernest Siva, a Serrano elder, led us in a blessing. San Bernardino County Supervisor and U of R Trustee James Ramos ’09 proceeded in leading the Bird Singers in songs to honor all the scholarship recipients. I really enjoyed the bird songs; from a listener’s point of view, the melody is enjoyable and, from a cultural viewpoint, a lot of tradition is engrained within their songs. Next, introductions were made to highlight the people who made everything possible. A video of past San Manuel scholarship recipients showcased how being a San Manuel scholar impacted their lives. I could relate to them because they appreciated the scholarship for the same reason I do—we wouldn’t have our Redlands education without it. I personally knew many of the students in the video, which made it even more special (although admittedly I had to hold back giggles seeing them on camera)! When it came time to call the new San Manual scholarship recipients’ names, I was both excited and nervous to receive my certificate, have my photo taken, and hear my short biography read aloud. It was so nice to listen to my college career as a creative writing major summarized in such an orderly fashion. In comparison to the freshman, who are just starting their Redlands journey, I sounded distinguished and accomplished, which made me feel downright awesome! Words of encouragement and bird songs concluded the evening. I was worried for a second that I would never see any of these people again; it is my sincerest hope that they continue to participate, because the Native community helped me survive and thrive at Redlands for these past three years. I have an immense amount of appreciation of San Manuel for my scholarship, and it makes me want to work even harder to show my gratitude. San Manuel made it possible for me to continue my studies, as affordability was a significant factor in my decision to attend Redlands. When I found out I had received this scholarship, I was so excited. It provided relief from the financial stress I was feeling about school and allowed me the freedom to focus on my classes—and, eventually, to find a place at the University of Redlands.